We believe that every space has the potential to achieve more – and floor graphics could be the key to unlocking this for your business. No matter what material your flooring is made of, indoors or outdoors, there’s no ground that floor graphics can’t work with. To spark your imagination and creativity, we’ve come up with 5 creative uses to step up your floor graphics, ready to feel inspired? Everything about your building says a lot about your business and brand. It’s time to abandon the bland and plain flooring. Floor graphics are a great way of injecting some life and personality into your building and really showcase what your company is about to your staff and visitors. The floor is a big open space waiting to be used – so why not make the most of it by advertising your product or services? Floor graphics are great for not only letting your customers know what you have to offer, but also point them in the right direction and increase your foot traffic. A study by the German Consumer Research agency, GFK, found that retail stores with floor ads sold 17% more than those without – proving that floor graphics are a powerful POS tool that your business should get behind. With roughly 50% of walk-ins shown to notice floor graphics, they are an excellent way to make use of space that otherwise would be ignored. Using floor graphics as a form of wayfinding is a brilliant space saving solution that ensures your customers, visitors and staff can always comfortably find their way around. Wayfinding floor graphics can also create pathways or sets of footprints to follow between locations – perfect for big or confusing buildings. Floor graphics aren’t only great to look at, but can also act as multifunction activity space. 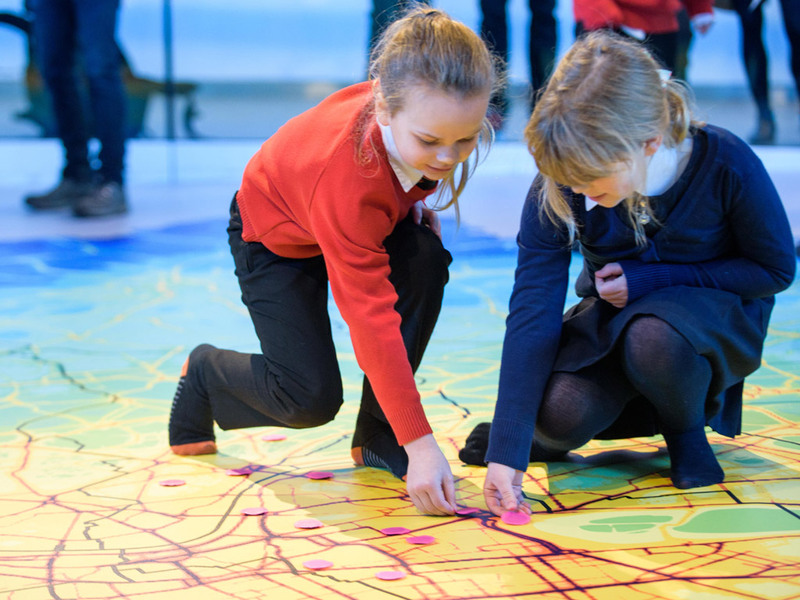 For example, this giant map floor graphic we created for London City hall also became an activity space for children to complete tasks, learning through interaction. Floor graphics don’t need to be educational, they can also be a handy way to create zones or areas within open plan rooms, creating defined spaces without sacrificing the collaborative, spacious and open environment. Every part of your building is a blank canvas for creativity. Floor graphics are a great way to tap into some of this creative spirit, giving you a unique opportunity to really impress your guests. Floor graphics can also be used to offer information to your guests – including infographics about your company or product, or even exhibit information in a visitor’s center. When it comes to floor graphics – the only limit is your imagination. They’re an excellent way to make use of space that would otherwise be wasted. Working closely with you, we can help you create bespoke graphics to make your business stand out. Want to see how floor graphics can benefit your business? Get in touch with our team – we’d love to hear from you!